One click downloads of Flickr Images have become a reality. Flickr Downloader is a software for Microsoft Windows including Windows Vista that lets you download Flickr Images with the click of the mouse button. Configuring Flickr Downloader is done in the matter of seconds. The only choice that you have to make is to select a default picture size and the picture output directory. The user has the choice between medium size, large size and original size. It is possible to change the size of the image to be downloaded on the fly as well. Flickr Downloader uses an explorer like interface that can be used to navigate Flickr. The Save Picture dialog pops up whenever you reach a page that displays a single image. It is possible to optionally select an title and tags that are used in Flickr Downloader to organize images. I would prefer this to be a Firefox extension or Opera widget instead but this is a great software. I had troubles installing Flickr Downloader on my Windows XP system but it ran fine on Windows Vista. Most probably a glitch on my system though. Update: The application has not been updated since 2009. While still available on Codeplex you may experience issues working with the program. I have tested it under a 64-bit version of Windows 7 and it worked just fine, but was sometimes slow to update the image results. You may get a "not responding" message from time to time but the program should recover from that automatically. Just wait until the results are shown and you can continue to work with the program. The program does not let you download copyrighted photos, and I highly recommend to check the creative commons filter to only display photos that you can download using the program. 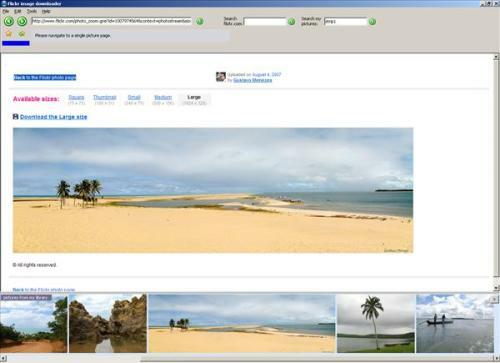 You can however double-click on any photo displayed in the application window to open the photo's page on Flickr.